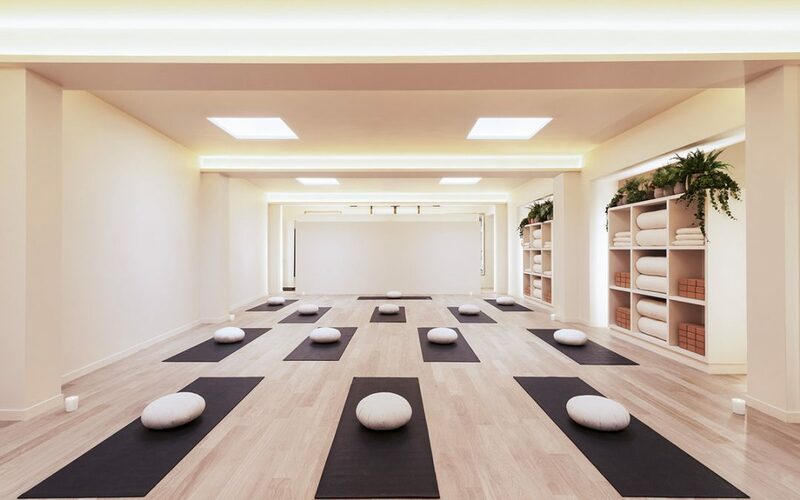 Kshanti, a centre exclusively dedicated to yoga, open since early October, is a true spiritual bliss, including the premises—located in an old church—revisited in noble materials like brushed oak, and refined, bespoke elegance where it’s immediately easy to feel zen. After interviewing several of the participants at the end of the course, all answer in unison: “You come out feeling fulfilled, something special happens in these sessions.” We can confirm, we tested it for you. When listening to the beautiful and bubbly Catalina Denis—the founder of the place—we quickly realised how dedicated and determined she is, and we understand why Kshanti is… “special”. Born in Colombia, she has jetted the world between Paris, Los Angeles, London… At the age of 17, she started practising yoga with her grandfather. During the years when she was a model and an actress, she practiced more and more, to focus, and to make up for this “dispersal”. “Hatha, Iyengar, Ashtanga, Juvamukti, Kundalini, Vinyasa;” fans will understand and appreciate the diversity of the courses (for kids as well). During her travels, through her encounters, Catalina has continued her relentless pursuit of quality: to find the rare bird, i.e. her teachers. Those that give the practice its noble reputation and sublimate this discipline going back to the high Antiquity, well before J.-C. The bet is held. She is today surrounded by the best teachers from the four corners of the world. And that changes everything: “I fought so hard to find them, they are amazing! We share the same spirit, the same philosophy: being together in one place, with the same energy, in a place where people can just be, without watching each other, where beginners and the ultra-advanced all have their place. Yoga has saved my life”, she says in her beautiful South American accent. At the end of the first course, and the first “OM”—the first vibration—it feels like a great encounter, and best of all: it is one that reminds you of yourself.